Asking customers for a small commitment can end a cycle of “maybes” and get you to “yes.” One way to encourage customers to say yes is to offer a free trial. Asking customers for a small commitment can end a cycle of “maybes” and get you to “yes.” One way to encourage customers to say yes is to offer a free trial. This can work for both products and services, and can be especially effective for subscriptions. A mattress retailer offers a 30-day, in-home trial of their mattresses. After sleeping on the brand new mattress (instead of that lumpy, misshapen thing they had been tossing and turning on) for thirty blissful nights, customers have a choice: Keep the mattress and pay for it, or call the retailer to come and pick it up. Which do you think the vast majority of customers choose? Once customers have tried the new bed they want to keep it. Offering the free trial got them to say yes and give it a try. An Internet marketing expert offers a free 60-day trial membership to his online coaching club when you buy a $97 ebook from him. The coaching club expands on what customers learn in the ebook, offering video instruction, teleseminars, and interaction with the expert. Many people would resist paying $97 a month for the coaching club without first experiencing it. After getting the free trial, most choose to continue and pay the monthly fee once they discover the value they receive. A way to offer a free trial of your services is through a free consultation or assessment. Meeting with a potential client can make them more comfortable with you, and gives you a chance to show them what you know and how you can help them. It is important that you provide useful information, even in a free consultation, so that customers have confidence in your ability to solve their problems; however, you do not want to give them so much for free that they believe they no longer need you. When I do free consultations, I give a few tips the customer can use, and provide suggestions for next steps. They come away with something of value, and trust that I can do the rest for them. Some businesses choose to charge a token amount, such as $1 – $5 for a trial. This further qualifies people receiving the freebie as good prospects. After all, even paying $1 requires more commitment than simply taking something that is free. It also requires them to set up a payment method. With a valid credit card authorization on file it becomes easier to keep them saying yes, because you can bill the credit card for the remaining payments or recurring subscription fees. Getting payment information from customers up front should always be done ethically. Make it clear how much they will be billed after the initial trial. Make it easy for customers to cancel if they decide it is not for them. And remind them when the trial period is almost up. Often, a trial can be the perfect way to demonstrate to customers that they can not do without you. When you promote your customers, you create a situation where everyone wins. The people you feature may feel more loyalty to you, keeping them as long-term customers. When you promote your customers, you create a situation where everyone wins. The people you feature may feel more loyalty to you, keeping them as long-term customers. It may cause them to send more referrals to you. As for your customers, they get more exposure and more opportunities to get new business. Not only will they like that, when their business grows it may result in more business for you, too. Offer links to customers’ websites from yours. Better yet, ask for testimonials and include links from their testimonials to their websites. Bring customers together by hosting networking events or making referrals. 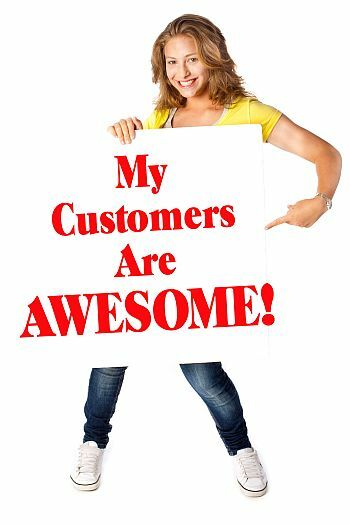 Include your customers in your publicity. Or, write a case study about your client and offer it to trade publications. Always get permission before using your customers’ names or other information. Some will want to maintain their privacy, but most will be happy and appreciate the opportunity you are giving them. Would you like to sell your products on one of the largest, most visited ecommerce sites in the world? Amazon.com makes it easy for merchants to sell products of all kinds on their site, so take advantage of this opportunity to reach a worldwide market. You may think of Amazon as a book seller, but you can find everything from books and CDs to household goods, clothing, toys and even groceries. In some cases Amazon buys product to resell to customers, and in others merchants sell directly to customers using the Amazon.com web site. The following descriptions will help you to determine which program is best for you. If you produce books, music or video, you can enroll in Amazon Advantage. For just $99 per year, you can list products on Amazon and easily add information such as cover art, descriptions, editorial reviews and more. The pages for your products can look just as good as the pages for books, CDs and DVDs from major publishing houses and studios. In the Advantage program, Amazon orders products from you and they fulfill customer orders. You receive 45% of the retail price that you set. So if you price your product at $20, you would receive $9 for each one sold by Amazon.com. This is true even if Amazon chooses to discount the price and sell the product for less than $20. Apply to Advantage at http://advantage.amazon.com/. Once the book, CD or DVD is listed in Amazon’s catalog, you can also sell directly to customers through Amazon Marketplace. Just go to the product page and click on the link that says, “Sell Yours Here.” The buyer pays Amazon.com, then you are notified to ship the item to the customer. Amazon provides a shipping allowance and pays you the price you set minus applicable fees. You can also sell other products through Amazon Marketplace, including housewares, electronics and more. If the product is already available through Amazon.com, just click on the “Sell Yours Here” link. If the product you want to sell is not already in the Amazon catalog, you may add it if you are a Pro Merchant seller. Pro Merchant status requires payment of a monthly fee, but the per transaction fees are lower than for standard Marketplace sellers. Learn more about Marketplace and Pro Merchant at http://www.amazon.com/gp/seller/sell-your-stuff.html/. Selling on Amazon.com puts your products in front of Amazon’s millions of site visitors. Suggestive selling is a powerful tool that can increase your revenues–and your bottom line–significantly. We are all used to the order taker at a fast food place asking if we want fries with our burgers, or if we would like to “Jumbo-Size” our orders, but suggestive selling can work in any business. Shoe stores suggest socks or polish to go with your new sneakers, hair salons recommend styling products, and stores selling electronics offer an extended warranty on the gadget you just bought. In each case, the business encourages the customer to add on to the purchase they are making. Upselling can be done in person, on the phone or over the Internet. Many online shopping carts allow you to set up a product-specific upselling page. That means that when someone orders Product A, they get the suggestion that goes with that product. Someone who orders another product receives a recommendation appropriate to that product. Make the suggestion after the customer has made a commitment to buy. Don’t try to add on to the sale before the customer has made a firm decision and is in the process of buying. Upsells should be related to the original purchase. An upgrade, a warranty, accessories, or something else that adds on to what the customer is buying can be effective. The customer is more likely to see such a suggestion as helpful than as simply a sales ploy. Consider making the upsell a “two-fer” offer. Because the customer bought one item at regular price, they are able to get a second at half price. The add-on product should have a lesser cost than the base purchase. Suggesting batteries to go with a radio works. Recommending a radio to go with a battery purchase doesn’t. Don’t hit customers with a lot of upsells. One (or possibly two) is enough. Badgering them to buy more can backfire and maybe even kill the sale completely. Make sure employees and order takers are making upsell offers to customers. Remind them of the importance of doing so, and consider rewarding them for great results, or even when you “catch” them upselling. Give telephone order takers a script that includes a suggestive sales offer. Done properly, an upsell is helpful to the customer and builds your profits as well.